In May we moved house just a few weeks after finding out that our previous landlord was selling the house. Luckily we stayed in the same area but moved to a smaller house. It's a nicer house but it is definitely much smaller. There's no designated parking space, no garage (the other had both!) and one big thing is that it's only got two bedrooms! As a family of 4 coming from a 3 bedroom house where the children both had their own room - one of which was huge, it was a bit of a shock for the whole family to be honest so now the children are 'happily' sharing a bedroom and toy space too which at times is a little tricky as we've gone from separate toy boxes to me just quickly cleaning up and popping older kids toys in with toddler toys! Not ideal really and I wonder how long Oliver - who is 7, will like sharing his toy space. When we first looked around this house, I didn't think we would even fit everything we needed in.... I was just in a complete panic as I didn't want Oliver to change school, we have alot of stuff too so it was a huge worry especially as Michael has a 5ft fish tank but we have managed to fit everything in and actually it's really comfortable and cosy! The thing is you just need to make the most of the space you've got! So our 'snuggle chair' is now in our dining room because it won't fit in our living room with our sofa which is nice as you've got two separate sitting places to chill out.. behind the snuggle chair is where I keep my pushchair so it's out of the way - there is no hallway anymore to have that in ready to go out, oh how I took that for granted. I have to get it out every time I need it which is a little irritating but better than having it in the way.... Our front door literally opens into the living room (well it doesn't open completely as the sofa is in front of it or there's just not enough space *if someone knocks on the door they have to wait a minute whilst I move the sofa! *) so space is very limited. My top tips for making the most out of your small rented living space would be have shelves, plenty of hooks, storage units with cube boxes are a fab idea especially if you've got children and you can get various sizes of those too... if floor space is limited - go up! Have your TV mounted onto the wall, it saves having a chunky tv unit - even a stylish one is chunky when you've got a small house! Find clever little places you can store things - like behind the snuggle chair for my pushchair! A ceiling clothes dryer really does make a huge difference, you can dry washing but it's not in your way at all. We couldn't fit a chest of drawers at the end of our bed next to the bathroom door so we actually have a clothes rail which only cost us about £9 and it has some of my clothes hanging on. I actually put my favourite items of clothing on it and really like that I can see it, the door can open more as it takes up less space too. Underbed storage is a must for small houses, it gives you that extra space that otherwise will just be wasted. Small houses can't waste space! Turning a rented house into a 'home' is often a little tricky, there's certain things you cant do obviously but our favourite is to add accessories things that you can take with you when/if you move because you don't want to have to start all over again collecting homely feel bits and bobs, change the curtains, add some rugs, mirrors always make spaces look bigger, cushions and photos, signs on the wall and even wall stickers - you can get ones that are reusable and they come off perfectly without leaving a mark. We got our new bed just before we moved house! On moving day, the delivery men tried to get the bed upstairs through the house but it just wasn't possible - our house was too small for our newly purchased superking bed so it had to be passed in through the upstairs window! Thankfully we have gorgeous sash windows but if we didn't? Not sure what we would have done about the bed that's why the new range by Bed Guru to me sounds fantastic, ideal for small spaces which is good considering British homes have halved in size over the last 90 years and children are forced to share a bedroom in a fifth of UK households - which makes me feel better as its not just my two! The range from Bed Guru is also a great idea for you if you privately rent - you just never know when youre going to be moving house so it would be nice not to have the worry of whether your bed will fit in or out the house! Sleep specialists and bed retailer Bed Guru have launched a collection of convenient self assembly beds and headboards called The Landmark Collection. 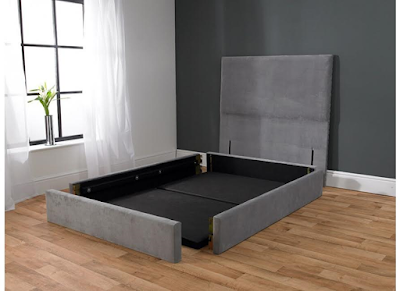 Because they are a simple slot/clip into place design the beds can very easily be taken down and reassembled somewhere else which means if you're going to be moving house these are ideal for you! I think they sound great and as they're available in lots of different sizes as well as bespoke bed sizes to fit into your awkward spaces they are suitable for everyone - I know I thought what about bedding too but don't worry because Bed Guru have that covered as they offer a range! The Landmark Collection would have been perfect for us and that why I'm taking part in the #SmallSpaceSleeping campaign, I may have been worried before about how small our house is but now I love it. It's our home and we're making the small space work for us. Please note that this post was written in collaboration with Bed Guru but all of the opinions are my own.